This shmear is oh-so-good and will keep in your fridge for about 2 weeks in an airtight container. We like to have brunch, and this is a great EASY addition. Regular cream cheese is boring. Spice it up! 1. In a small bowl, beat softened cream cheese, sugar, and syrup til creamy. 2. Add pumpkin, spices and vanilla and beat til smooth. 4. 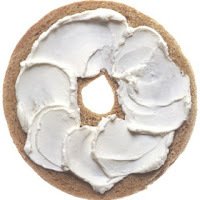 Enjoy on your favorite bagel! Oh yum! I'm getting hungry!